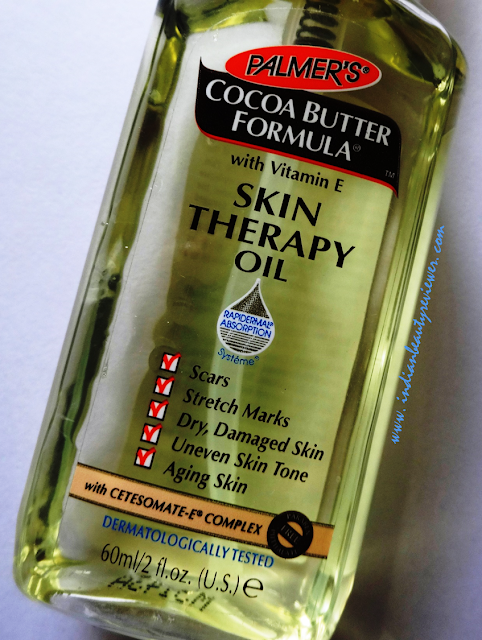 Here I am reviewing the Palmer`s Cocoa Butter Formula Skin Therapy Oil with Vitamin E and CETESOMATE -E (R) Complex. One of the key ingredients of this oil is the CETESOMATE -E (R) Complex which is an integral component of the unique RAPIDERMAL ABSORPTION SYSTE`ME (R). The RAPIDERMAL ABSORPTION SYSTE`ME (R) helps the powerful ingredients of this oil to penetrate deep into the skin for enhanced moisturization. The fast drying formula penetrates deeply without greasiness. The oil is non-staining and allows one to dress immediately after application. 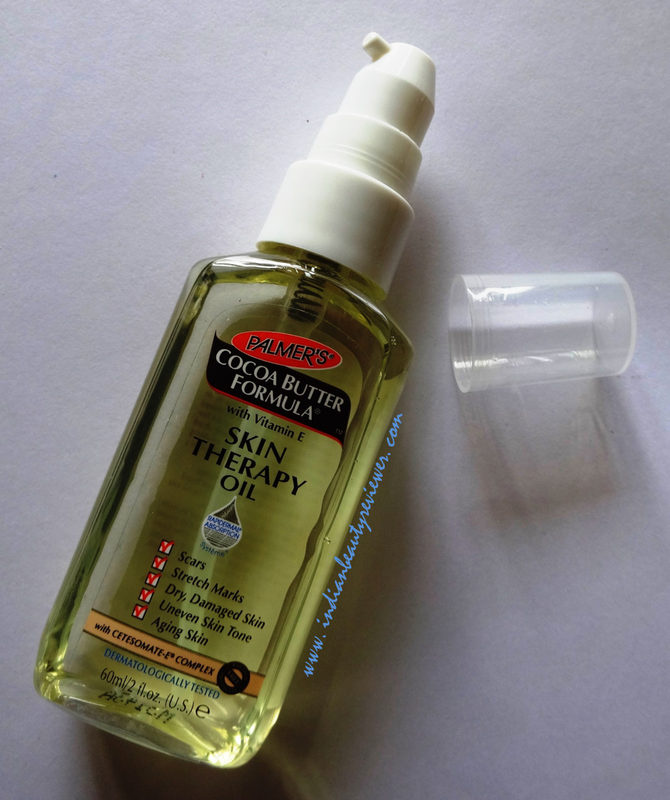 The Plamer`s Cocoa Butter Formula Skin Therapy Oil is an advanced multipurpose skin perfection product that can be used all over the body including the face. CETESOMATE -E (R) Complex helps improve the skin penetration and absorption characteristics of the formula into the epidermal layer of the skin. CETESOMATE -E (R) Complex along with the exclusive blend of key ingredients helps improve the appearance of scars, stretch marks, damaged skin,uneven skin tone, aging skin and fine lines and wrinkles. Skin looks and feels instantly soft and smooth with the unique non-greasy and non-staining formula. 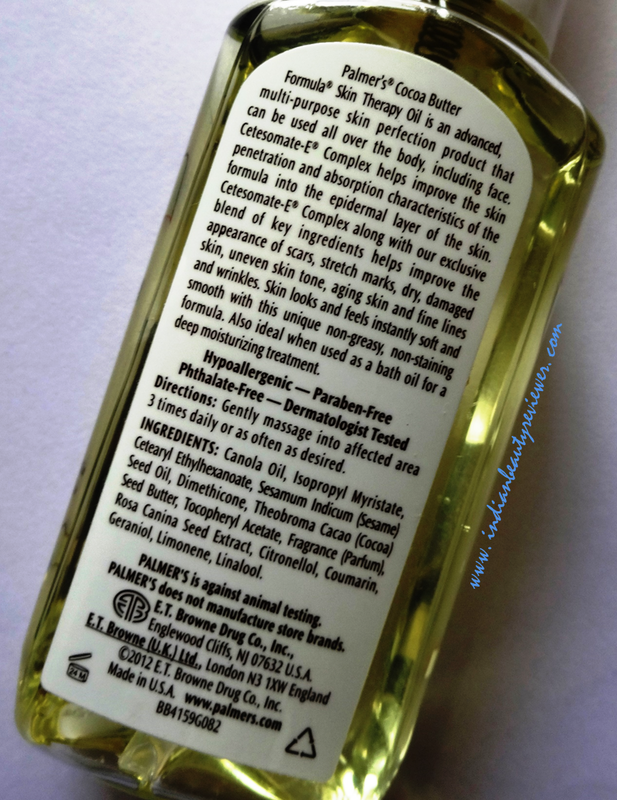 Also, ideal when used as a bath oil for a deep moisturizing treatment. As soon as I opened the carton packaging, I wondered if this was a sample packaging, it literally looked so snug ! 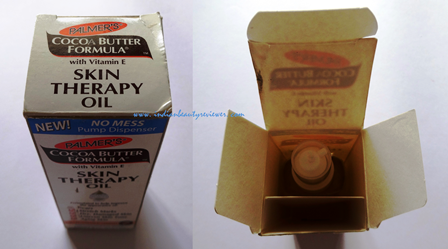 A very compact transparent plastic packaging with a pump on top to dispense the oil. It is very easy to carry around because of the compact and light packaging. The cap for the pump dispenser is also of transparent plastic that fits very snugly onto the white pump. A single squirt of the product from the pump dispenses enough product to spread entirely on an averaged sized abdomen. The oil gets absorbed into the skin like its not even an oil, as if it was a part of the skin! The immediate oily sensation lasts for upto 5 - 10 seconds and then the area appears hydrated, supple, glowy and a bit firmer than before. After having used this product for a few weeks now, it seems as if its regular use has improved the elasticity of my skin. I`ve mostly been using it on my elbow, knees, abdomen, chest, upper arms, inner thighs, love handles, occassionally on my feet and sometimes on the hips. This is when I use it on my own but I have also been getting body massages twice weekly and then I get it massaged on my entire body. 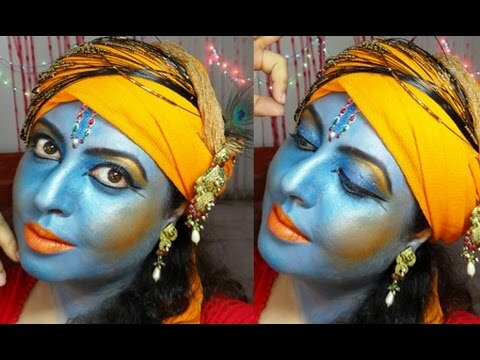 So I`ve seen a remarkable difference in the hydration and elasticity of my skin but mostly I have seen a reduction in the appearance of few stretch mark lines that I have here and there on my body.I haven`t tried the oil on my face as I have very sensitive combination to oily skin so I was a bit skeptical to try it there. Though I really want to test it out sometime to see if it works for acne scar reduction on the face as I keep getting those zits and acne from time to time which leave horrendous scars too and take a long time to clear away. Thus I cannot comment on the scar reducing ability of the oil. 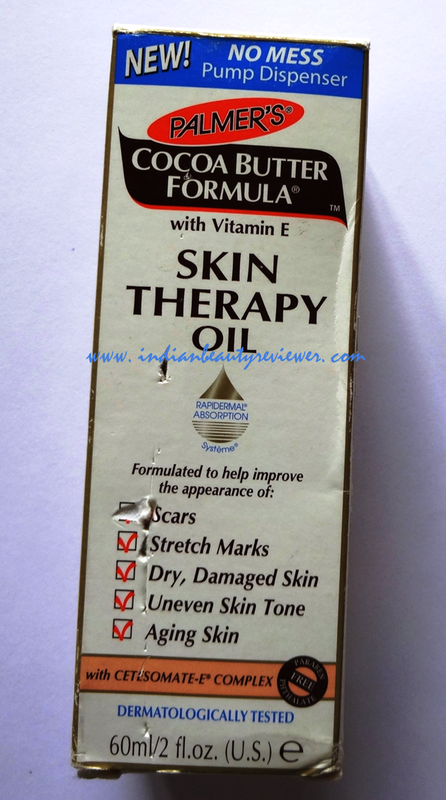 I do feel this oil should be tested for scar reducing on other scarred areas of the body like an injury scar . I do have a minor surgery scar on my arm and I will be using the oil on that area/scar and see how it will fair there. So most probably I will be returning to update this post regarding the scar reducing ability of this oil. 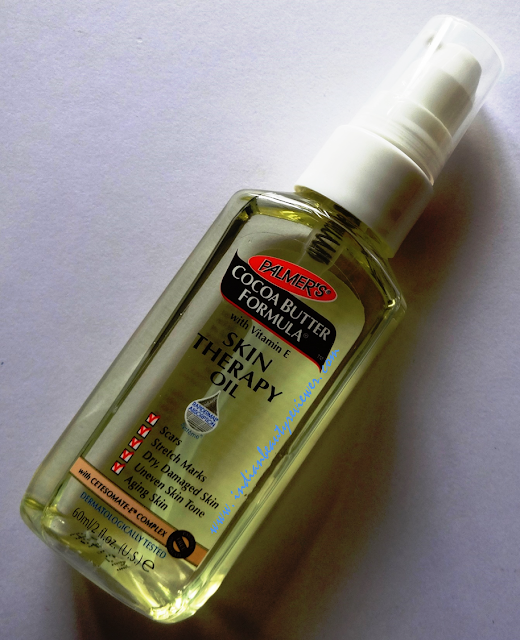 The Plamer`s Cocoa Butter Formula Skin Therapy Oil has a very baby powder like soothing and powdery fragrance with a hint of cocoa but just coz I said baby powder don`t think that the smell is not potent. The smell of this oil is very strong and because its an oil, the fragrance lasts for a long long time, practically the whole day and several days after until you do not get that clothing item washed which you were wearing at the time of oil application. Superstrong and long lasting smell! I feel this might also have to do with the fact that my skin is oily as well so it came out even stronger on my skin. So overall this oil is a must-buy ladies for all the various things it can do and claims to do ! This oil is therapeutic for several problems mentioned above. 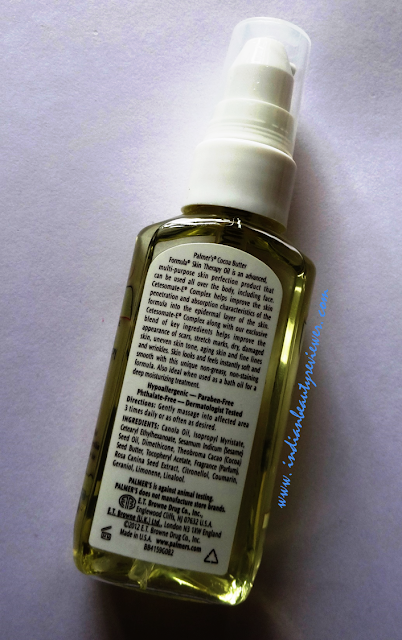 It definately worked for me and I will be repurchasing it once I use up the bottle which will be pretty fast. So if you love your body, don`t think twice about including this product in your day to day skincare/bodycare regime. Both men and women will equally benefit from its regular use. I am so addicted to it already !